Picture of Grant Wood’s painting Appraisal. Mary Swander’s play will premiere at the Dubuque Museum of Arts followed with a talk by Dr. Randy Lengeling. Mary Swander, Iowa’s former Poet Laureate and Distinguished Professor of English at Iowa State University, will write a poetic performance piece centered around Grant Wood’s painting Appraisal. Based on research and interviews, this one-person show will explore the development and change in the poultry industry from the 1930s through the present. 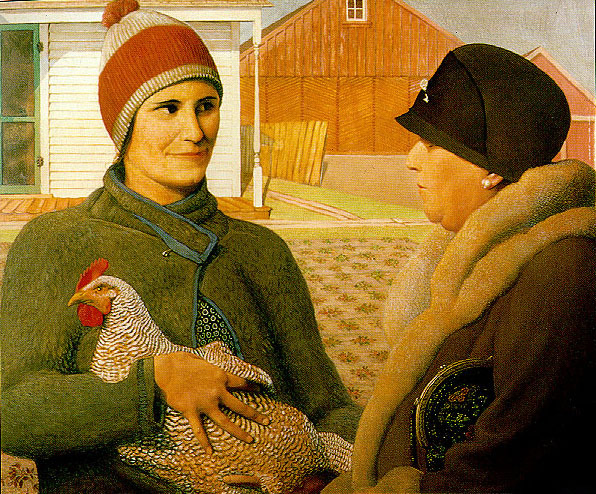 Dr. Randy Lengeling will speak about the Regionalist connections between Ellen Wagener’s and Grant Wood’s work. This event is supported in part by a grant from Silos and Smokestacks.